Way better than those little rubber-band powered balsa and polystyrene gliders we had as kids. Of course what these people have developed is a little more advanced than a bit of wood and foam – and a whole lot more fun to watch. This is older news, but new to me. It’s artificial heavy-than-air bird flight for real. 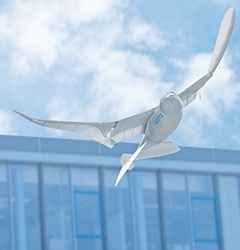 The people at Festo have built a robotic remote-controlled bird that flies under it’s own power. It’s fascinating to watch. It doesn’t motor around, it flies. Below is a short video showing their carbon-fibre creation in action. I’m showing this clip rather than others because the opening scene of it taking off under it’s own steam is worth seeing as are short segments showing the movement of the head and tail that I haven’t seen in other presentations of this – I can’t follow the interview itself, as I only know English! The company makes a range of robotic creatures as an off-shoot of, or part of, it’s work on robotics, including aquatic robots of fish or rays, a common theme being fluid dynamics, robotics and basing design on biological systems.